Diabetes has become an epidemic in past few decades and complication arising from it have made people more fearful about it. The worst fear of all is getting blind due to diabetes. High blood glucose level can directly affect your sight and it can make you blind if the blood glucose level remains high for months or years. Diabetes is something to fear about but if you keep your sugar in control through dietary and lifestyle changes then you don't need to fear it. Diabetic Retinopathy or Diabetic Eye disease are other common names to tell about sight loss due to diabetes. How diabetes affect your eye sight ? Eye sight problems occur in 80% people suffering from diabetes for more than 20 years. This fact is sufficient to tell you the severity of diabetes and how it affects eyes. Diabetes is responsible for 12% cases of blindness in US every year. 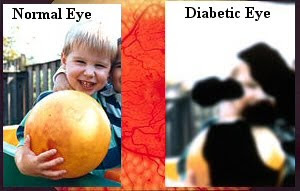 Vision loss due to diabetes is caused by following medical conditions. Lens loses its focus: Some fluids are accumulated in lens of eye. It affects the focusing ability of lens and vision gets out of focus as curvature of lens is disturbed. But this condition can get better if the sugar level is controlled. Glucose harms blood vessels in retina: High blood sugar is harmful for tiny blood vessels in retina. It narrows them and blood flow is decreased in retina. At this stage no vision loss occurs and it can be reversed if sugar level is controlled. Macular edema: In this medical condition new blood vessels may form in retina to provide proper amount of blood to retina. These new blood vessels are fragile and sometimes get burst causing blood loss in retinal region which blurs the vision and sometime responsible for complete sight loss. Damage to optic nerve: Optic Nerve is that nerve that transfers the vision signals into our brain and brain coverts these signals into image. Due to above mentioned condition the pressure on eyes increases and it can harm the performance of optic nerve and may damage it. According to some researches, those who are suffering from diabetes from past 25 years are more susceptible to nerve damage. If that nerve damage occurs in your optic nerve then you may go blind. Our eyes are a precious sense organ in human body. So the only way to save them from the above mentioned negative effects of diabetes is to save yourself from diabetes and keep your blood sugar in control.